Grass River connects Clam Lake to Lake Bellaire in the chain of lakes that also includes Torch and Elk Lakes. 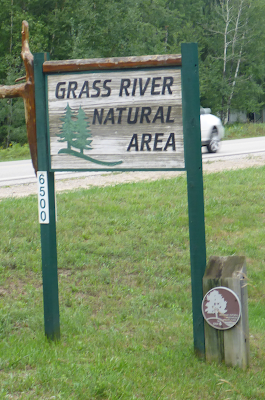 Grass River Natural Area protects almost 1,500 acres. 80% of that is wetland habitat (mostly cedar swamp). 250 acres are upland forest with pine, maple, elm, spruce and fir. I hiked the boardwalk and trails there with Haley Breniser, the Executive Director of the center. We walked half of the 7 miles of trails through the preserve. Grass River Natural Area protects a vital part of the Great Lakes watershed. These wetlands are vital to cleansing water as it moves through the chain of lakes. The center here offers events, classes, and even summer camp opportunities.